The future of Chicago Public Schools grew brighter Sunday, August 13 after the Illinois Senate voted 38-19 to override Governor Bruce Rauner’s amendatory veto of the school funding bill. Black leaders praised the move, saying CPS and minority students would have suffered under Rauner’s plan. The vote moves the bill closer to helping CPS, which is counting heavily on the state to provide financial relief to the cash-strapped district. The bill is now in the hands of the House, where it has 15 days to decide on the override. The deadline to send out state aid payments expired August 10, but the state lawmakers need to approve an “evidence-based” school funding formula before it can release those funds. The requirement is part of an agreement Democratic lawmakers included in a budget package that was passed in June. Under Rauner’s plan, CPS would have received $463 less, according to an analysis by the Illinois state Board of Education. Democrats were concerned that school districts such as Chicago would lose money in the next several years under Rauner’s plan, which would have redistributed funds from CPS to other school districts in the state. It’s a plan that Rauner said ensures fairness because the state is tired of bailing out CPS. State Senator Jacqueline Y. Collins (D-Chicago) issued the following statement. The Senate override of Rauner’s amendatory veto is good news to CPS, which recently unveiled a $5.7 billion 2018 budget after it announced a $269 million shortfall August 11. City officials are mum about where the funds would come from. In addition to funds from the city, the CPS budget is counting on $300 million in the school funding bill that’s now in the House. Chicago officials say the CPS budget will serve as only a framework for the eventual fiscal 2018 budget. 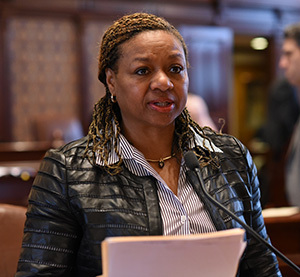 “Today, the Illinois Senate voted once again to fix Illinois’ worst-in-the-nation school funding formula by enacting a school funding model that provides fair and equitable funding for all Illinois schools. “Under the governor’s amendatory veto, Chicago Public Schools would lose hundreds of millions of dollars. The governor has spent months pitting Chicago against downstate for his political gain, and now he’s trying to harm Chicago’s children by taking away funding for their schools. It’s absolutely unacceptable. 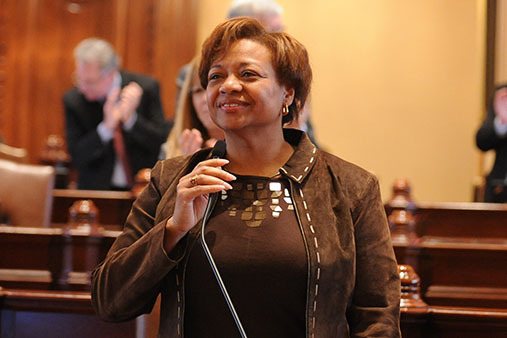 SPRINGFIELD – Ex-offenders can now obtain their birth certificates at no charge thanks to a measure sponsored by Senator Patricia Van Pelt (D-Chicago). Senate Bill 1413 waives the fee for birth certificates for individuals when they are released from a Department of Corrections facility. Senate Bill 1413 passed both chambers unanimously and was signed into law on Wednesday. “Today, Governor Rauner blew up decades of work to change Illinois’ worst-in-the-nation system of school funding. His rhetoric against Chicago and CPS belittles the real challenges faced on a daily basis by the district’s nearly 400,000 students.